The Knitsley Farm Shop and Granary Cafe is based in the Lanchester Valley, in County Durham. Inovica had the good fortune of being able to work with with Knitsley in order to build a brochure website for their business. The product of a husband and wife collaboration, the Knitsley Farm Shop came about as a pursuit for a better life, and also a challenge for Edward and Rachel. Truly a family built and run business, the Knitsley Farm Shop saw blood, sweat and tears as family and friends took on an integral role in making the business come to life. Everything from the physical construction of the farm shop, to the day-to-day running of the business has seen a huge involvement from Edward and Rachel. You can also find three generations of the family at the farm and shop year round. 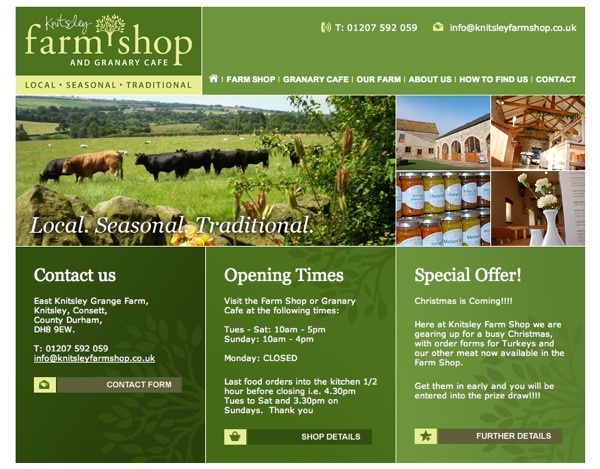 Inovica has developed, and now launched, a brochure website for the Knitsley Farm Shop. The purpose of the website is to advertise what Knitsley has to offer and to attract visitors to the shop, so the opening page of the website offers some images of the shop and location, along with vital contact and visitor information. 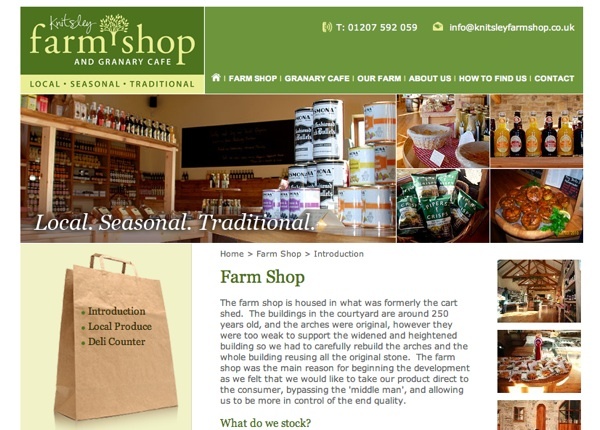 The remainder of the website offers pages of space for information about the business as a whole and for images of the farm shop and its surrounding area. The Knitsley Farm Shop continues to be a strong business, providing traditional farm goods to local customers and visitors from further afield. Boasting countryside views, while being situated not too far from from their local town centre. The Knitsley Farm Shop makes a great place to visit and is very easy to get to. Please visit the farm shop and cafe website for more information about Knitsley.